How many coats is too many coats? Oh wait, I know, I know! Oh goody! Oh joy! 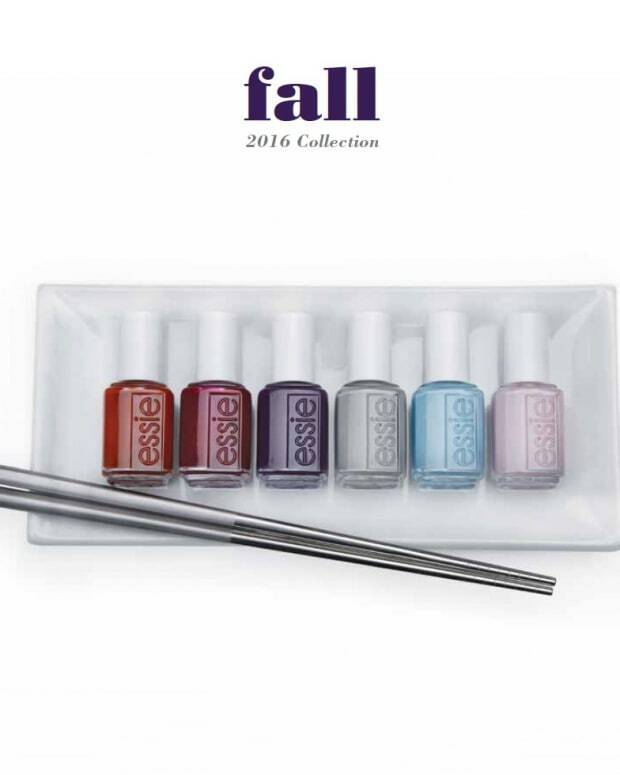 It’s the Essie Neons 2016 collection and it’s lovely and bright! Let’s look at the mostly colour-perfect (at least on my side of the screen) swatches and then we’ll chat, yes? 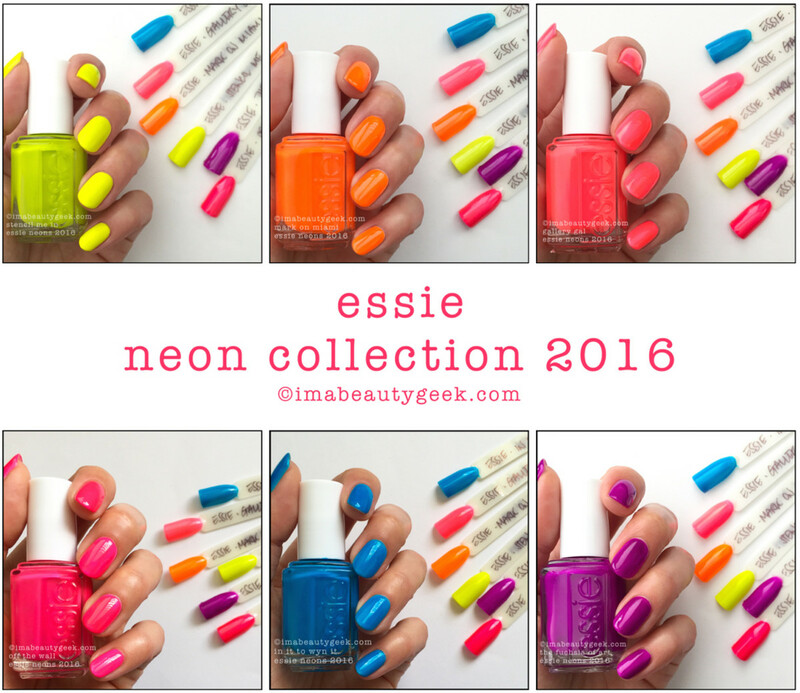 Before we get started, I should mention that Essie has a white Prime & Pop base coat to go along with the Neon 2016 collection. It’s in a regular Essie bottle with a skinny brush and while some people might be able to get it on in one coat, I cannot. How did I solve the problem? I’ll show you later, down there after the swatches. Essie Stencil Me In (above). She’s a lime-tinted yellow that’s awesomely bright. She only needed two coats of colour over my white base and what you see there doesn’t have top coat. 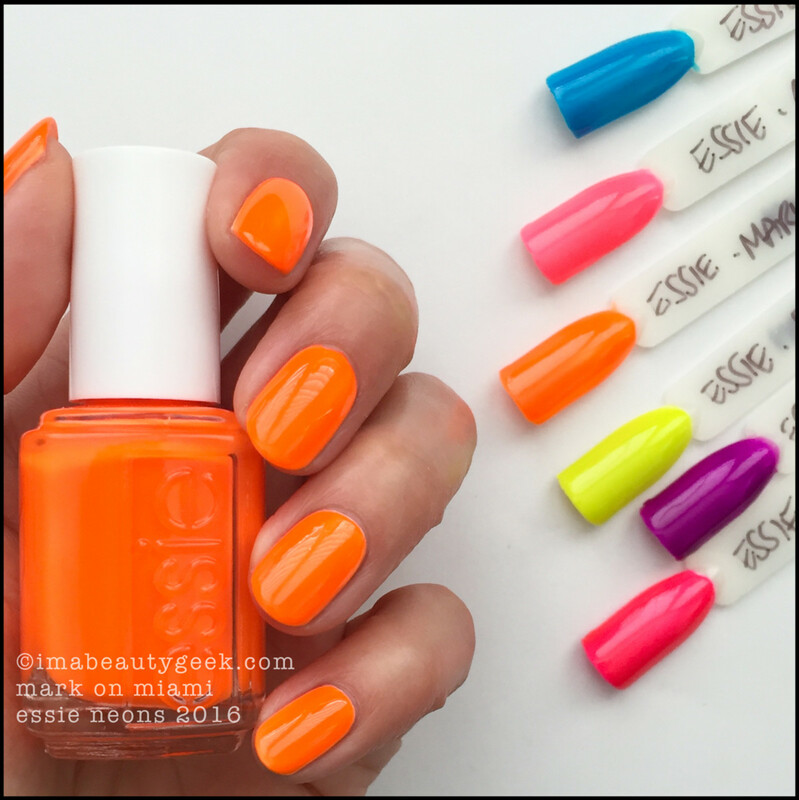 Like most neon polishes, the 2016 Essie Neons dry matte. Essie Gallery Gal (above). Again, two coats of colour over white, but this has top coat. 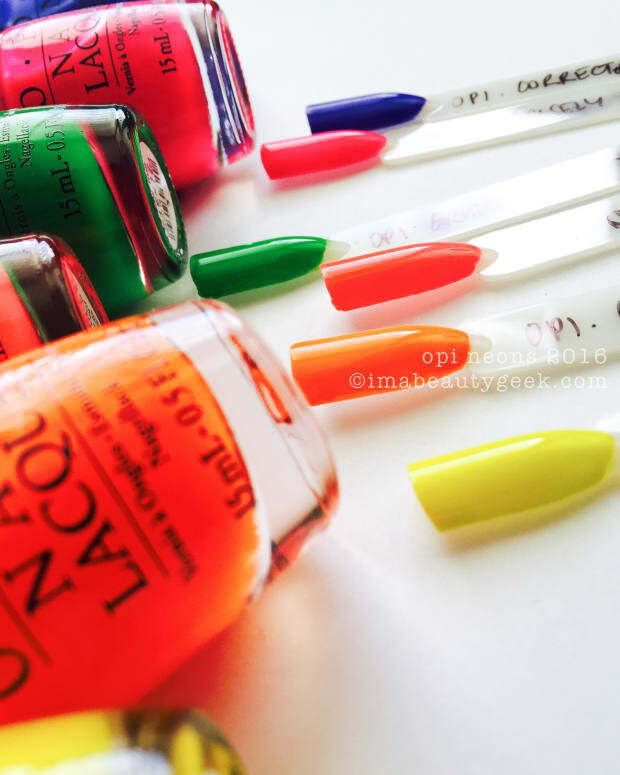 The formula on these shades is remarkably similar to the OPI Tru Neons: thin and waaay too translucent. The Essie brush, however, is somewhat easier to use to get an even coat. Either that or their formula is a little thicker. 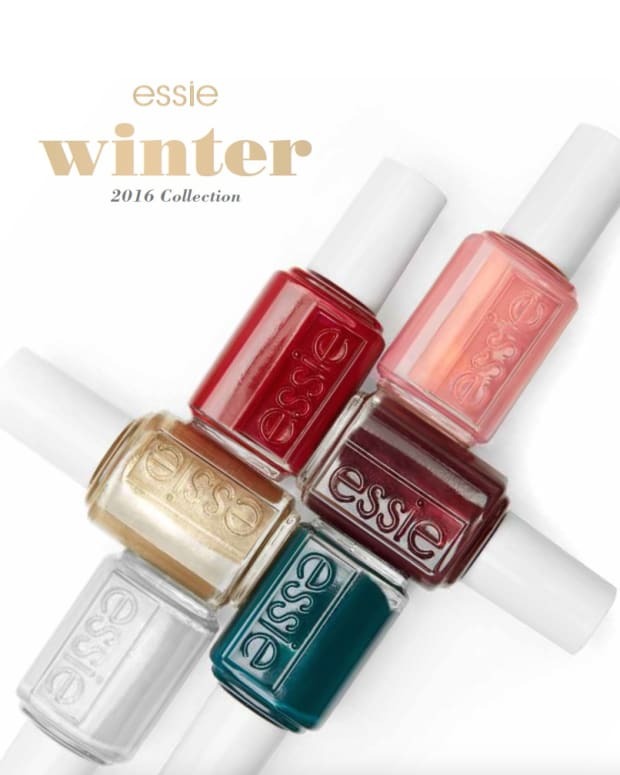 Essie In It To Wyn It (above). I could 100% not get my camera to reproduce this turquoise-leaning shade accurately and at this point, I’m so fed up of these neon formulas that I just don’t care. I suppose I’ve been spoiled by China Glaze and Orly who seem to be able to make a two-coat, opaque neon that doesn’t require undies. This swatch is white base + four colour + top. And it’s still patchy. Ugh. Essie Mark On Miami (above). My OCD demands I get these on looking good enough to shoot. It’s quite the effort. Sure, they look swell in the photos but every single swatch was an exercise in frustration. At least this one was only base + two coats of colour + top. Maybe I should have some lunch? Or more coffee? Or less coffee? 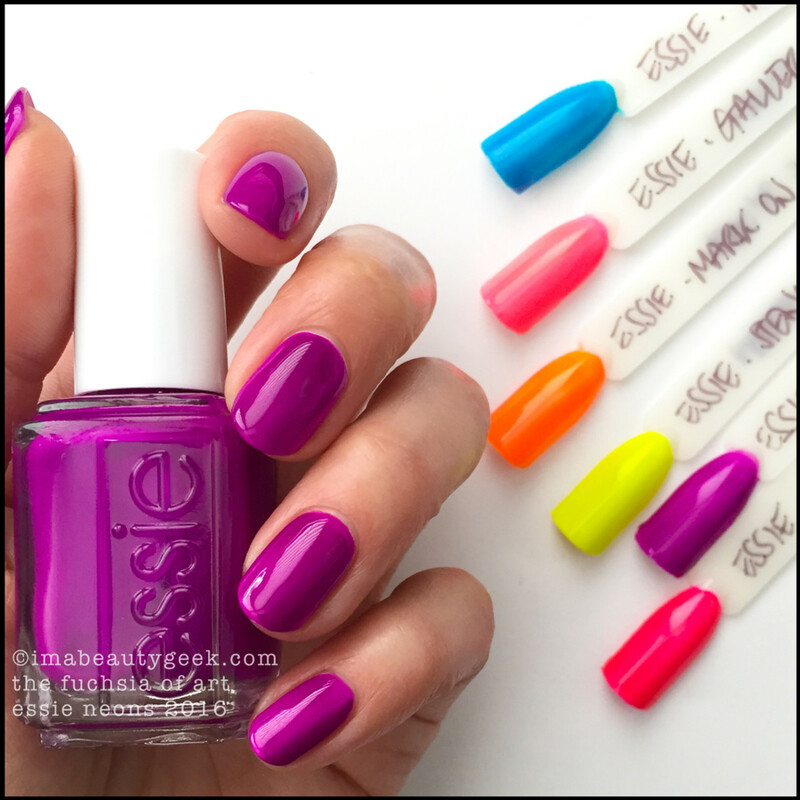 Essie The Fuchsia of Art (above). Oooh! Such a pretty shade! But yes, you’ll have to work for it. That’s my secret-weapon base coat + three coats of colour + top. The colour dries fast so if you don’t get it on there evenly, it’ll dry showing your uneven coat and you’ll have to try to even it out with the next one. Fail at the next one and you’ll have to try to even it out on the third coat. I seem to get lucky on the third coat. 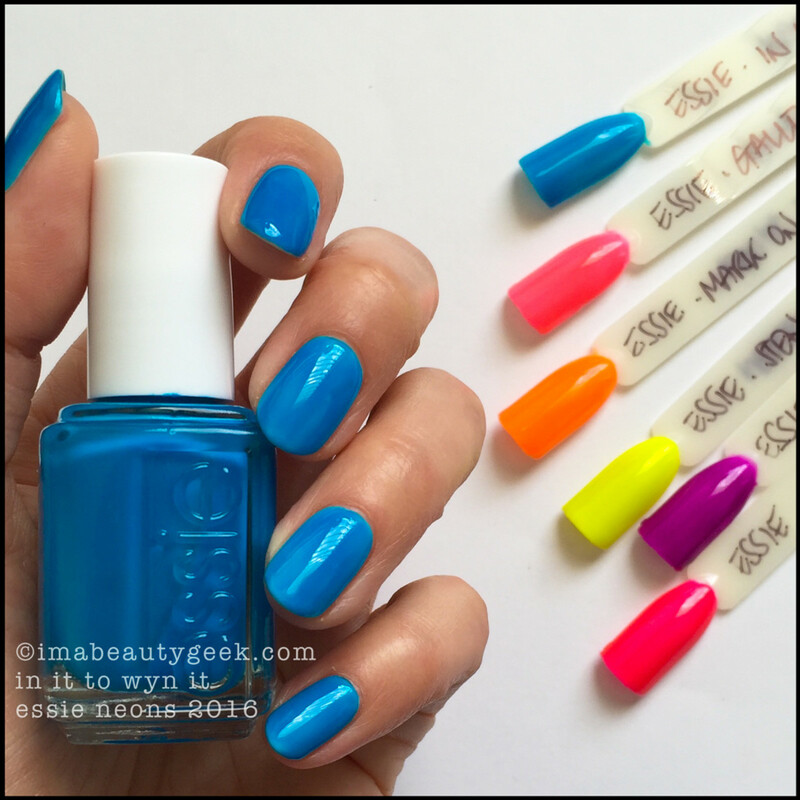 Essie Off The Wall (above). And finally, this bright pink. Yes, lovely. No, not easy. Base + three coats + top coat = too much work. 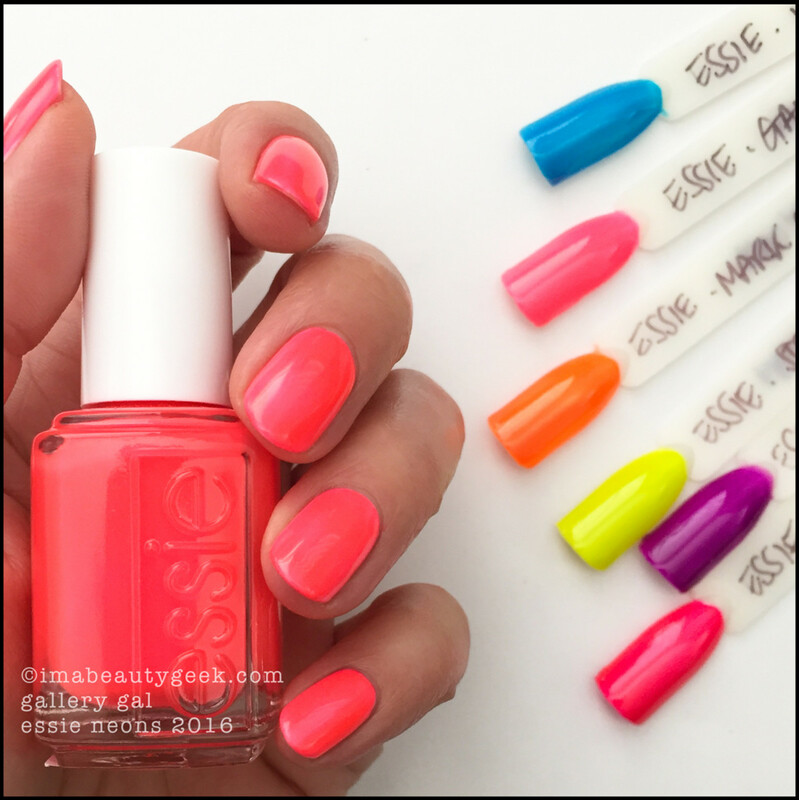 I don’t know why both OPI and Essie have reverted to the old school neon formulas and I hazard to guess that it has something to do with the FDA and the neon pigment. 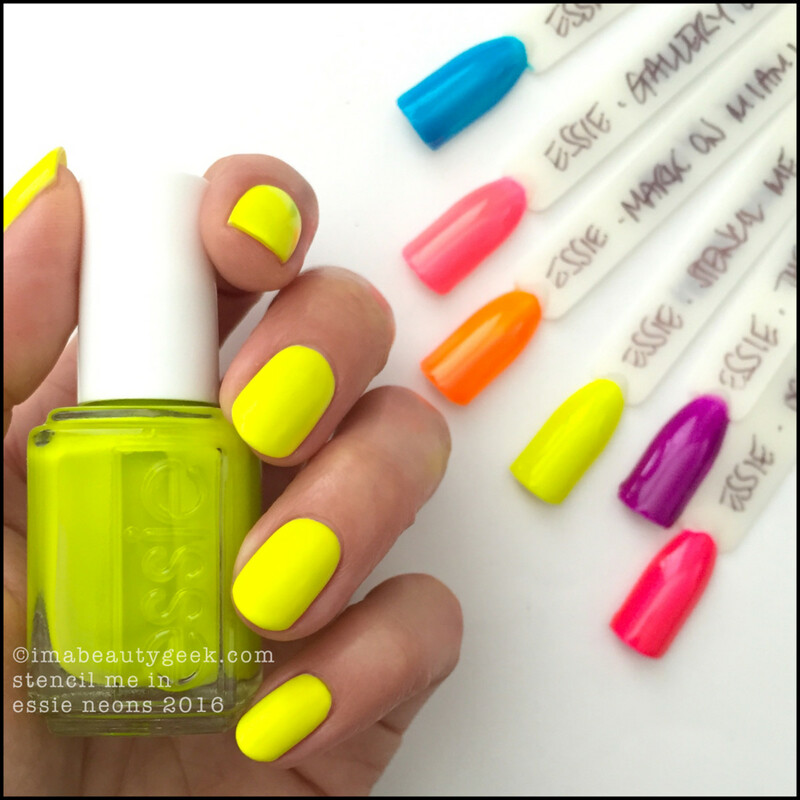 I’ve heard rumblings (aka rumours with no facts) that true neon pigments are not approved by the FDA for cosmetic use. I’ve also heard that smaller companies were selling non-compliant neons – or something to that effect. If this is indeed the case, I think we should hang on tight to those bottles of neons we’ve got that don’t require undies. They’re much, much easier to use. Oh ya! I meant to show you this! 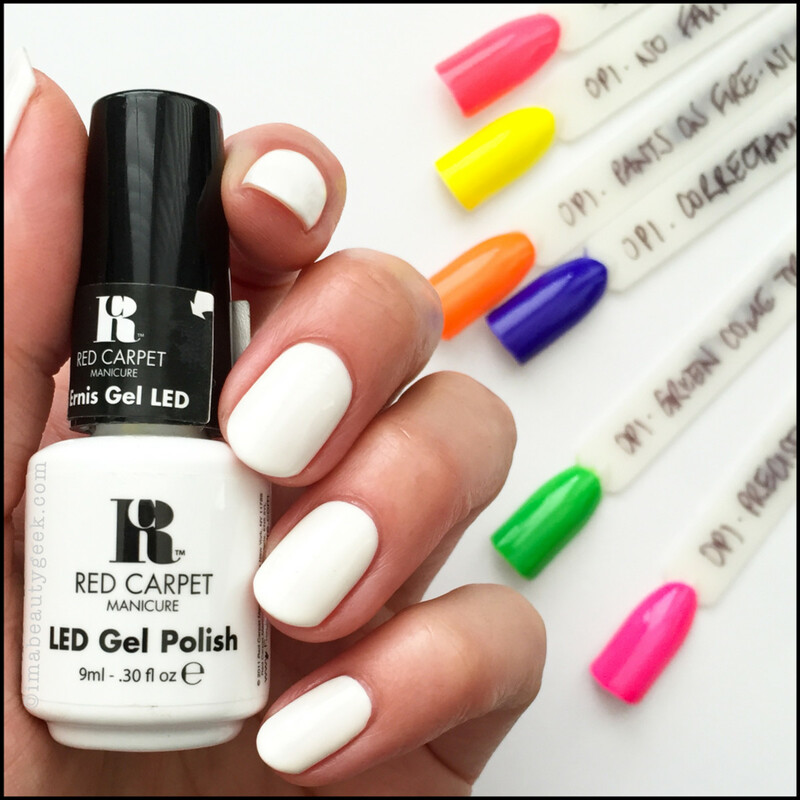 It’s Red Carpet Manicure ‘White Hot’ soak off gel (above) and it’s what I used as my basecoat for this collection and for the OPI 2016 Neons. Why? Because it meant I didn’t have to do two irritating coats of white under every single mani. Smart, right? If I didn’t have that technology, I don&apos;t know if I&apos;d have swatched this whole collection. Essie may have been happier that way but hey, they made ‘em so I’m reviewing ‘em. Your thoughts friends? 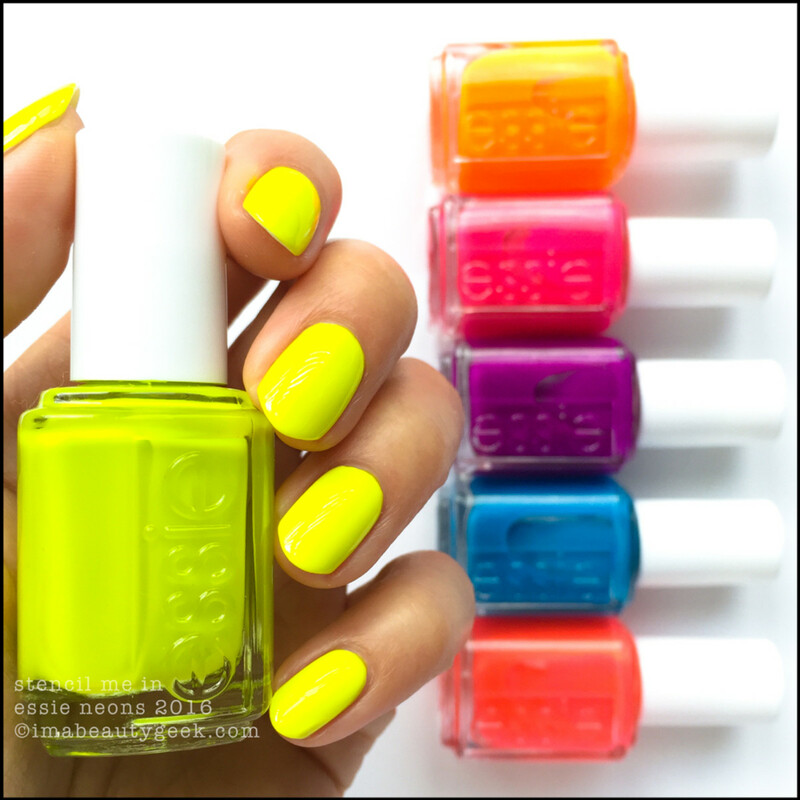 Are you willing to do two coats of base and at least two coats of colour plus top to get a neon? 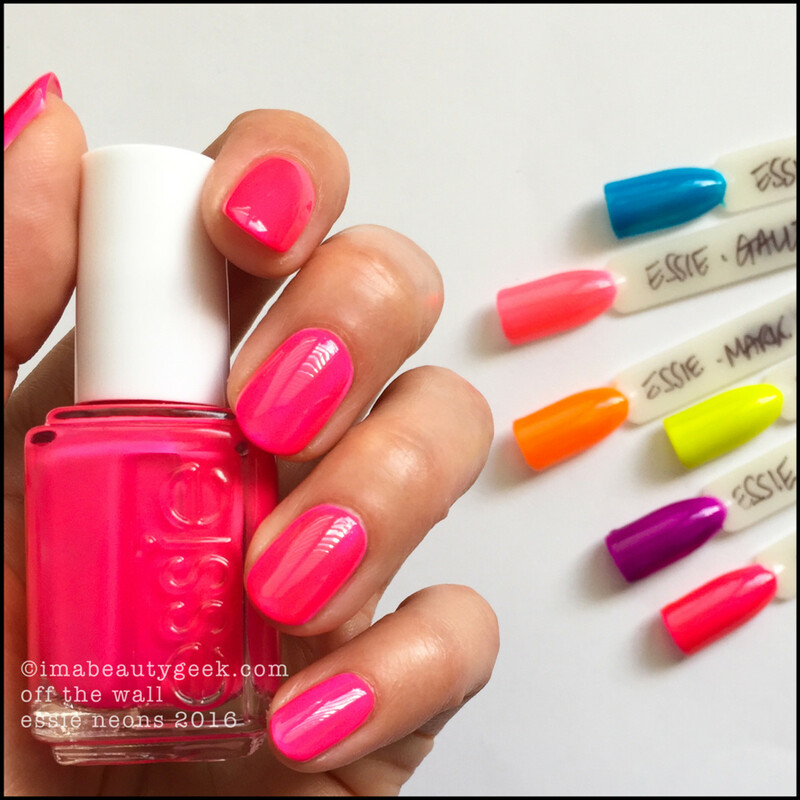 If you are, the Essie Neon 2016 Collection will be available starting August 16 at beauty destinations all over the place. I’ll bet ulta.com, amazon.com, and tradesecrets.ca will carry ‘em. Manicures & Photographs Karen Falcon (she’s off #WanderingTheArchives).